The first 5 minutes of The Cabin in the Woods is a perfectly written hybrid of idle dialogue, sudden shock, and scantily-clad females: and that is how you get an audience involved in your picture. So while the remainder of the film doesn’t mix its ingredients to a ratio of quite that Reese’s Peanut Butter cup-level of perfection, it certainly manages to surprise and entertain in equal amounts. Lampooning the horror genre isn’t too difficult these days, but pulling off the execution is definitely a feat worthy of praise. I think my biggest disappointment, and remember that this is relative to the rest of the film’s superior quality, is the fact that the twists and turns promised by the film’s initial set-up come to a halt around the middle of the film. To the dismay of the audience, the scenario set up in the first act or so is pretty much the long and short of the surprise – no more revelations await the viewer. I wasn’t totally turned off by this, but as I slowly began to realize that nothing else was going to shock me, some of the excitement value of the film deadened. Of course, the overt metaphors of the story offer a lot of food of thought, giving the film more depth. Joss Whedon’s sharp dialogue is evident in the off-beat banter, and Drew Goddard’s solid directing carries the film just fine. I don’t want to give away too much about the plot, but what I can say is that I don’t think I’ve seen such a bizarre movie in quite a long time – and I’m not sure that its strangeness totally works in the film’s favor. Don’t get me wrong, though; subtly weaving philosophical quandaries with absurdity and parody can only really be achieved when the people steering the ship are slightly off-kilter geniuses, and it is because of this that The Cabin in the Woods largely succeeds – it’s just nothing to totally lose your head over. Side Note: The puns will stop when morale improves. That poster for Drew Goddard and Joss Whedon’s “loving hate letter” to horror films has been taped to my wall since January 2009. Notice that the release date claims Cabin will be out in 2010. Unfortunately, due to MGM’s financial issues, it was not released until 2012. Thankfully, Lionsgate came to the rescue, allowing us to see what we have been waiting for for 3 years. I don’t give every film that much of my life. Equally, if not more impressive, is the fact that in those 3 years, I somehow avoided every sneak peak, script review, and festival screening report that came my way; with the exception of the theatrical trailer, I made it to the theater yesterday with not a shred of The Cabin in the Woods spoiled for myself. I cannot suggest more strongly that you do the same; we will do our absolute utmost in this piece to avoid any plot-specific details. Alright, let’s dive into it. I immensely enjoyed Cabin in the Woods. As a deconstruction of horror films, Cabin manages that rare feat of spoofing, criticizing, and celebrating its genre all at once. Not an easy feat, as comedy-horror is one of the hardest acts to balance in film. Most attempts end up feeling like a mash-up of scenes from two tonally different films. Cabin, however, blends comedy and horror together more coherently then I have ever seen in a film. The plot isn’t funny and then scary, or scary and then funny. Cabin is consistently hilarious and frightening throughout its running time. Director Drew Goddard has achieved a perfect balance of tone, which is even more impressive in light of the sheer number of moving parts and layers that the film contains. While Cabin relies on the existence of the past couple decades’ horror films as meat for its deconstruction grinder, I am confident that this accomplishment in tone will change the genre. Fans of Joss Whedon will be happy to see several of his regulars turning in solid performances, such as Fran Kranz, Amy Acker, and Tom Lenk. Chris Hemsworth hints at the star power he’s shown in Thor and Star Trek, but Richard Jenkins and Bradley Whitford steal the show in roles I can’t bear to spoil. Newcomers Anna Hutchison and Kristen Connolly maintain substantial presence in a cast full of scene-stealers, which makes it sound like I’m not giving them as much credit as they deserve. Cabin in the Woods may not be for everyone. The film is quite “meta,” and anyone who doesn’t have at least a passing familiarity with horror movie tropes may have a sense of being left out of the joke. There’s also a scare midway through the movie that would’ve been more effective had it not been set up in an earlier scene. However, it’s a small blight upon an extremely enjoyable whole. 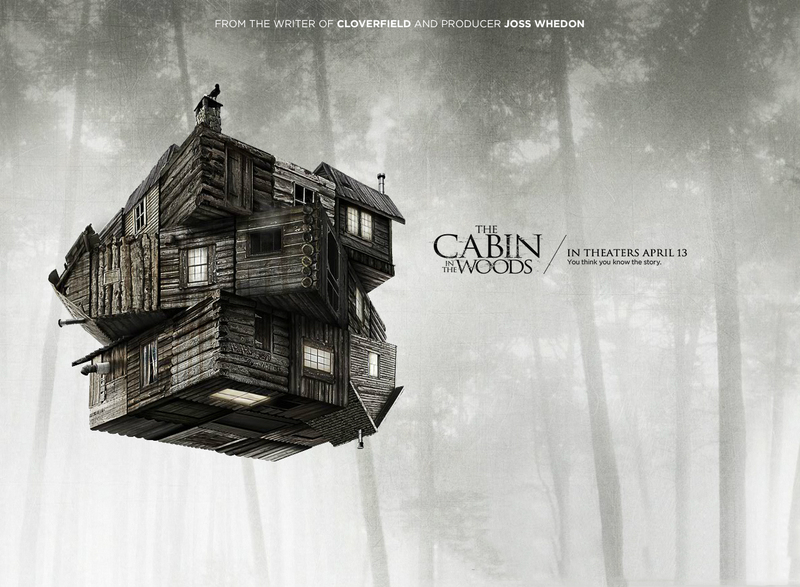 Cabin in the Woods is a very, very fun film that will defy your expectations. The positive mark it leaves on the horror genre may indeed be felt for years to come, but I am, for the moment, far more concerned with how soon I can see it again.